Above: Tooting Bec Lido, South London, venue for my first swimming event in over 13 years, the Cold Water Swimming Championships hosted by South London Swimming Club on March 24, 2007. Whatever we do in life, it's good to reflect on things, to look back and see what you have achieved, what you haven't achieved and what, if anything you could have done better to reach your goals. 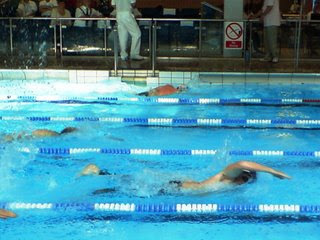 Below is a summary of my swimming events for 2007. 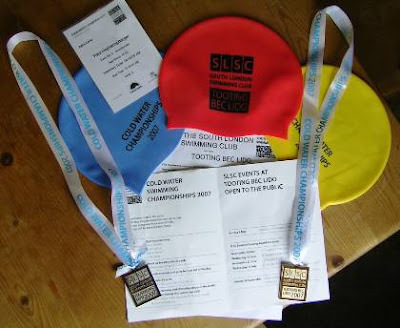 After spending winter 2006 heavily in training in both the pool and the sea, I entered my first swimming event of 2007, and my first for more than 13 years on March 24, 2007, three days before my 44th birthday. It was there that I met Kevin Murphy and Cliff Golding for the first time. This chance meeting led to me spending my weekends in Dover this summer training on swimmers beach, meeting Freda Streeter, The Channel General, Alison Streeter, Queen of The Channel, and ultimately I believe this was the major factor which led to me completing the channel swim in July. The great Jim Rohn once said "Things don't just happen, they happen just". I came away from Tooting having won a Gold in the Freestyle, and a Silver in The "Head Up Breastroke". These were my first swimming medals since 1983, some 24 years ago! 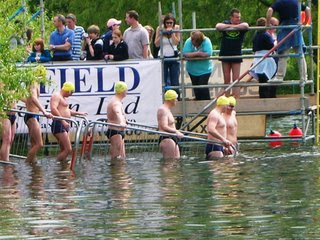 Having joined the British Long Distance Swimming Association (B.L.D.S.A.) 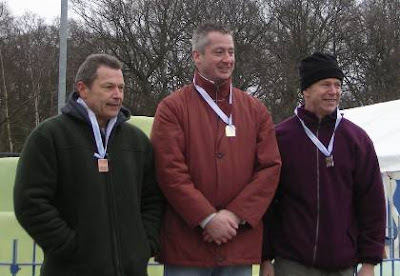 for the first time this year, the first event I competed in was the 4KM Race at Colwick Park, Nottingham in May. I had never competed in an open water race before, and it certainly was different to say the least, but also, really enjoyable. This was not a masters event, but an all age group event, and I was competing against swimmers from 18 years old, to some over 70. I was astonished and very pleased to come home in 6th position overall, in a time of 1 Hr. 1 Minute and 43 Seconds. Above: Entering the water at Colwick Park (top - 4th from right), and (bottom) exiting the water and getting my breath back after a mammoth last 750 Metre sprint to the finish line. This was the second (B.L.D.S.A.) 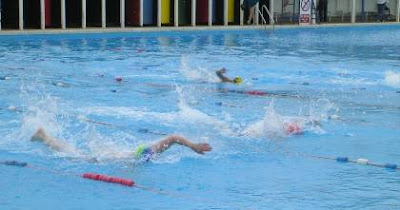 swimming event I competed in, and it was a really tough one. 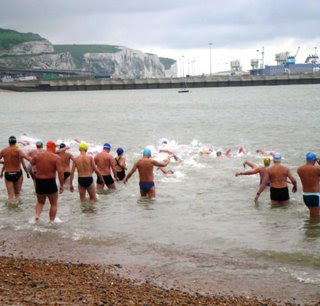 It involves swimming in three races in Dover Harbour. The first is 5 miles, the second 3 miles and the third 1 mile. All times are added together and the winner is crowned "Champion of Champions". It sounds simple but the drop out rate was very high. I was pleased to complete the event, and come home overall in 5th place. This again I found astonishing as it was an open age group, not a masters event. It was certainly good stamina practice for my channel swim attempt which was by then, less than a month away. Above: The running start of the first "Champion of Champions" event - The 5 mile race. Dover Harbour - June 16, 2007. July 10, 2007 will be forever etched into my mind. It was the day I swum to France. The elation I felt at having achieved something that had been in my mind for 27 years cannot be expressed in writing. Suffice to say I was ecstatic. Before I swum, people asked me how long I thought it would take. Based on my swim speed in Dover Harbour, I had 14 hours as a figure in my mind, although with the channel, it is impossible to say how long it will take due to the tides and weather conditions on the day. I completed the swim in 13 Hours and 52 minutes. I was pretty close with my estimate. It was a day I will never forget, and I can honestly say, that I thoroughly enjoyed it! I enjoyed it so much, that I agreed to do it again, only this time two ways! When I told Beccy I had booked a "two-way" she said "What would you like for tea?"!! Above: In the channel swimming with the Ferries. Tuesday July 10, 2007. When I asked my wife Beccy if it was alright to enter a race in Dover on her Birthday, at first she wasn't too pleased. As it turned out, it was a beautiful weekend which we all enjoyed thoroughly, and met Mark Robson who is attempting a channel swim in 2008 and his girlfriend Kelly. Loraine Verghese who was my channel swim support swimmer was also there collecting sponsorship money for her channel swim and it was generally a really great weekend. 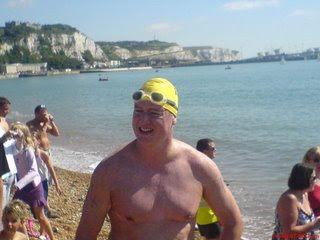 The race was organised by Dover Lifeguard Club and was from The Prince of Wales Pier, across the harbour, back again and finishing by running up the beach across the finish line. I was again astonished when it was announced that I had won the over 40's race, and a beautiful glass trophy was presented to me. 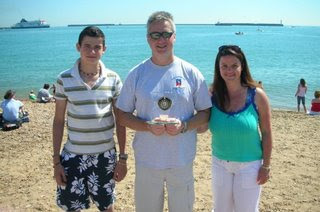 Above: (Top) Little Hoffy, me with Over 40's winners trophy, and Beccy on her 32nd Birthday. On Sunday October 14, 2007 I entered the Eastern Region Masters Championships held in my home town of Bury St Edmunds, Suffolk. I swum as a member of the West Suffolk Masters Swimming Club, and it was my first indoor competition since 1994, some 13 years ago. I was delighted to come home with 2 x Gold and 3 x Silver medals. 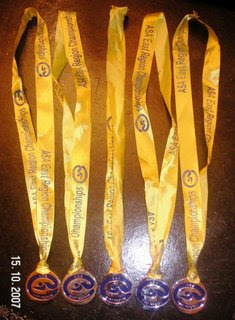 Above (Top): Swimming in the 100 Metres freestyle, and below, my medal haul for the meet. All in all, 2007 has been a fantastic year for swimming. When I retired in 1994, I never thought that I would compete again, and yet, this has got to be one of my best ever years for swimming. It certainly has been different! We've met some wonderful people, visited some new places, raised just under £10,000 for charity and hopefully next year will be just as good, if not, even better! Hi 21CM - I saw that story on your blog! I didn't realise it was in Tooting though. Tooting always reminds me of "Citizen Smith" - "Power to The People!". 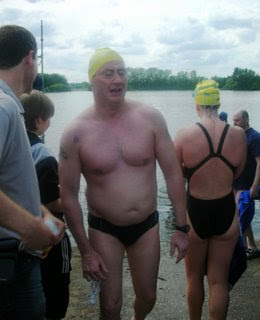 I have entered the World Cold Water Swimming Championships there in February 2008. It is a great pool, but will be only about 3 Degrees C. That's cold!